A pure blend of passion, technology and craftsmanship, the ProFinish is the first in a new line of products from Lucas ProTools by Lucas. Lucas is a well-established and award winning fit out and finishing specialist to the construction industry. Lucas provide a complete range of decorative and protective coatings services including general decoration, spray applied finishes, protective and hygienic coatings and special paint effects. With a blue-chip client list Lucas have worked on large scale structures such as The Savoy Hotel, Heathrow Terminal 5, Café Royal, The O2, the London 2012 Olympic Stadium, the McLaren Production Centre and the Shard, as well as prestigious hotel and residential contracts. We are proud of our heritage spanning over six decades and that of our manufacturing partners, which span from over six generations. We are at the forefront of brush design and manufacture, with extensive knowledge, innovative design capability with both modern manufacturing facilities and hand tooled craftsmen. Lucas ProTools work with suppliers that are trusted partners in specialist industries in the UK and across the world. So many decorators see the tool of their trade as a disposable item. Unlike chefs who treasure their knives, the decorator is forced to use a lesser quality, mass produced product that does not give the best finish for the paint that he/she uses. 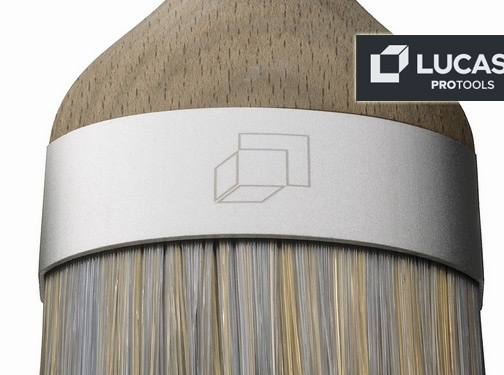 Lucas ProTools have ensured that the paintbrushes we manufacture are crafted items with hand finished details and that the manufacturing process shows the care of the product which passes from our hands to yours. UK (Wrotham) based business providing paint brushes, accessories and clothing for sale. Website includes e-commerce facilities, delivery and returns information (within terms and conditions), testimonials, regularly updated blog, full contact details including company registration number.